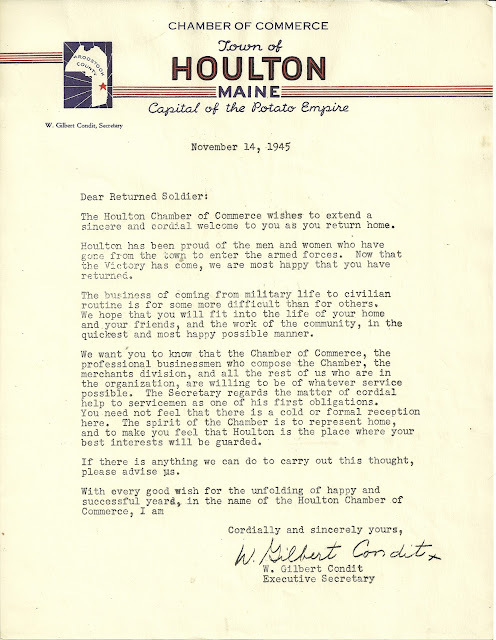 November 14, 1945 form letter from the Chamber of Commerce of Houlton, Maine, Capital of the Potato Empire, to Returning Soldiers from service in World War II. 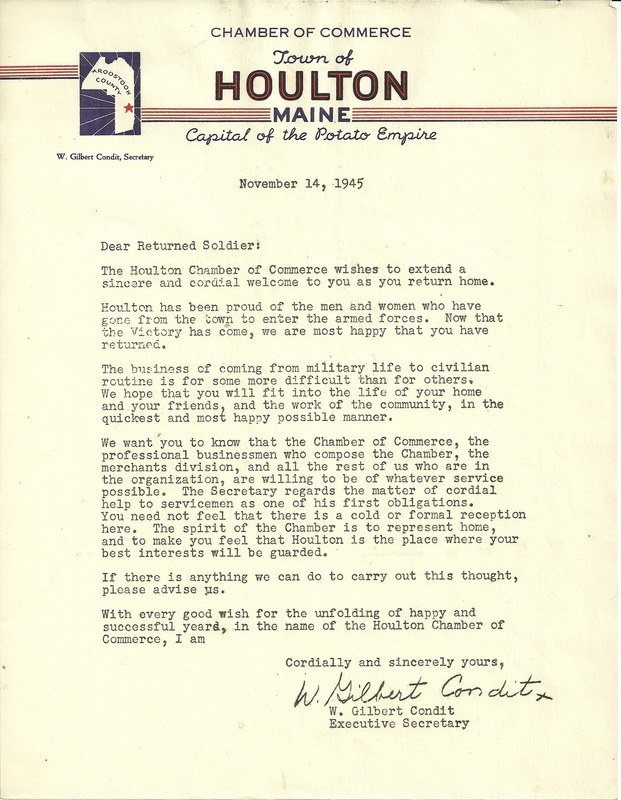 The letter was signed by W. Gilbert Condit, Executive Secretary. The Houlton Chamber of Commerce wishes to extend a sincere and cordial welcome to you as you return home. Houlton has been proud of the men and women who have gone from the town to enter the armed forces. Now that the Victory has come, we are most happy that you have returned. The business of coming from military life to civilian routine is for some more difficult than for others. We hope that you will fit into the life of your home and your friends, and the work of the community, in the quickest and most happy possible manner. We want you to know that the Chamber of Commerce, the professional businessmen who compose the Chamber, the merchants division, and all the rest of us who are in the organization, are willing to be of whatever service possible. The Secretary regards the matter of cordial help to servicemen as one of his first obligations. You need not feel that there is a cold or formal reception here. The spirit of the Chamber is to represent home, and to make you feel that Houlton is the place where your best interests will be guarded. If there is anything we can do to carry out this thought, please advise us.